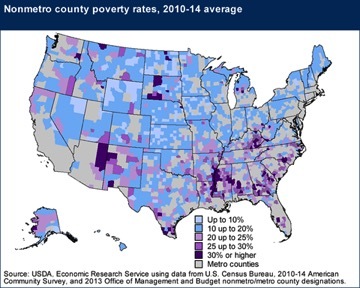 Does Poverty Affect Electoral Votes? Instead of visiting areas where Americans struggle the most to rise above the poverty line, candidates schedule rallies in populous urban areas in states that offer the greatest number of electoral votes, or in early voting states that offer the best opportunities for national media coverage. All five of these rural states’ electoral votes have gone to Republicans in every presidential election since 2000. The last time any went to a Democrat were in 1996, when Bill Clinton carried all but Mississippi to win a second term in the White House. Democrats have long since ceded these states—and their poverty-stricken residents—to the opposition. Republicans give them little attention either. But they do play on voters’ anger and fear, an easy campaign strategy given that many liberals dismiss the people in these areas as uneducated, gun-toting racists. Having grown up in one of those pockets of poverty and then having moved to a state in the shadow of our nation’s capital, I find it exasperating that it seems impossible for the media to move past the stereotypes of the poor in both areas. At the risk of stating the obvious, not all poor African-Americans in urban areas are criminals who are killing each other. And neither are all poor white people in rural areas lazy and racist. We know this, of course. But we allow our politicians to operate as if the stereotype is the single story of the poor in America. Candidates on both sides of the aisle are allowed to perpetuate these stereotypes in ways that are both explicit and implied. They spout platitudes about helping Americans and renewing hope in the American Dream, but none seem to understand the magnitude of what poor Americans face in their struggle to survive. Though the pervasiveness of visual media would make that kind of conversation harder in the current climate, social media could also work to the advantage of a sincere candidate who isn’t getting air time in the mainstream media. A candidate who could somehow figure out how to meet the poor where they live and find common ground would, as Kennedy did, come away changed. And perhaps might even come away not just as president—but as a president worthy of our respect.